We have been warned about bears pretty much consistently by every Ridgerunner, park ranger, and other experienced person along the trail for six weeks now. We diligently hang our food bags (even though it’s really hard sometimes to hang on a high branch), and use the bear containers or bear cables whenever they’re available. One time we used a very secure back door to a trash bin to keep all our food. Mice were our primary concern at that shelter. These videos show you how much work it is to hang food bags, which for some reason we call bear bags. Ironic, isn’t it? Sometimes a Shelter area will have bear cables, which make it much easier to hang the bags well. They are on pulleys and have handles to pull them up and down, with clips to hold them in place. Bears haven’t figured out the pulley system yet. Look closely and you can see the cable system in this photo after a freezing rain. I have to admit most the time I think I’m hanging my food bag to keep the mice from getting my food more than worrying about bears. Still, all those past stories of bears dragging hikers out of their tents because they had a candy bar in their pocket come back to haunt me as dusk settles and I snuggle into my sleeping bag. A couple of days ago we were near an area closed due to aggressive bear activity, and when we stopped to pick up a friend’s mail drop at a nice hostel and campground, we decided we would just camp there. It would be 7 miles before we were completely out of the bear zone and we didn’t want to hike that far after 4 o’clock. A fellow thru hiker, Smoke, decided to hike on and made it to the outer edge boundary of the Bear zone. He was the only one camping at his campsite, and in the middle of the night he heard something large moving around his tent. It became pretty plain it was two bears circling his tent and looking for something to eat. While he frantically googled what to do about bears, they continued sniffing around until they found the source of the smell that lured them to his site. It was his food bag, which was not too close to his tent and hanging in a tree about 10 feet off the ground and a few feet from the branch and trunk. He thought he had done a pretty good job of hanging his food bag, but in the morning it was gone – not a trace of the bag, the food in it, or even the rope he used to tie it off. The bears had snatched it all and taken off. Although there was much consolation that they just took the food bag and didn’t bother him, he was about 17 miles from a road. 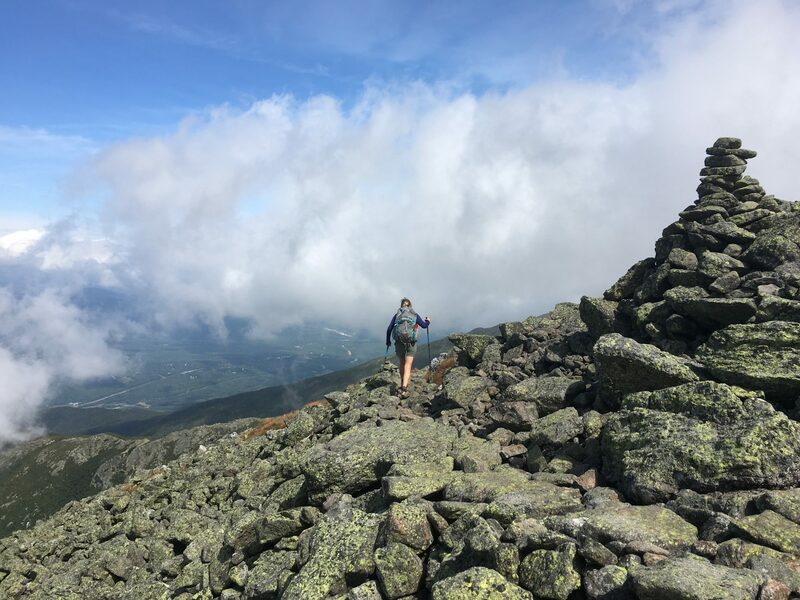 His guidebook listed a barbecue place that would deliver meals to that road crossing, so his plan was to hike as hard and fast as he could and make it by dinner, order two meals to be delivered and hike on to Damascus the next day, another 21 miles. Fortunately for him, there were trail angels at that highway who had tons of food, fed him well, then gave them a lift to town where his dad could come meet him. He must’ve been doubly lucky, because his dad had already planned to come meet him the next day and wasn’t too far away. Many dollars later, he had a new food bag, cook stove and food, and his dad was bringing him back where he left off just as we were enjoying the same trail angels’ generosity the next day. We all quizzed Smoke about how he hung his bag, where he was, and what it sounded like. You can believe we are much more careful to hang our food bag according to protocol now. I’m glad we hung our bag so well that next night, because although nothing happened on the forest service road trail where we were camped, two other friends who camped right on the trail had bears prowling around their tent that night. They didn’t have their food bag stolen, so I guess we are becoming better at hanging food bags!